Oh where to start, I suppose the best place is what I have added within the last 2-3 weeks…. I just realized that this may actually put some clarity and “accountability” on what I have in my stash. Solids: I am in desperate need of solids. 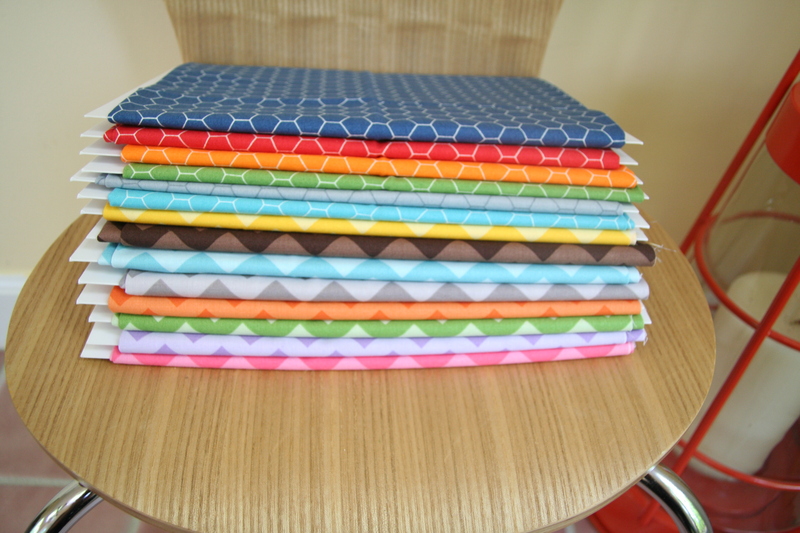 There are a couple of blocks of the month (BOM) or Mini Quilt of the month that I have signed up for and I really want to use bright solids. The first 3 on the bottom of the pile are actually Essex linens (which I am loving at the moment). The light blue grey and the blue are from our local fabric store – Thimble Pleasures and the Orange from Fresh Stash (an Etsy store). The rest of these solids are 1 yards of Kona cotton that I purchased at Thimble Pleasures. The bottom of the pile are the tone on tone chevron from Riley Blake. I have always liked the yellow on yellow and my 1/2 yard is almost out so I brought this fat quarter bundle from Hoot Couture (an Etsy store). I like most of it except maybe the brown on brown one. The hexagon fabric on top is probably one of my favorites at the moment – from a color perspective. The fabric is Oink-a-doodle-Moo Chicken wire by Jenn Ski for Moda and I purchased this at aMaterialGirlQuilts (an Etsy Store). Favorite Complete Bundles: I have two complete bundles I have been hanging out to buy, both are modern and simple prints which is right up my alley. My only issue I am going to have is how do you break up the set or even make that first cut….. This first complete set is Pure by Stof. It is a 33 piece fat quarter bundle. Look at the first one – aren’t those navy and reds great together. The second picture equally amazing with the gray’s, greens (loving the mix of green and navy too), and plums. My only disappointment in this bundle was once I saw the plum fabric I wanted more. I hope that Stof consider to do another release with more of the plum and maybe orange or yellow print colors (and then more grays to go with that release). 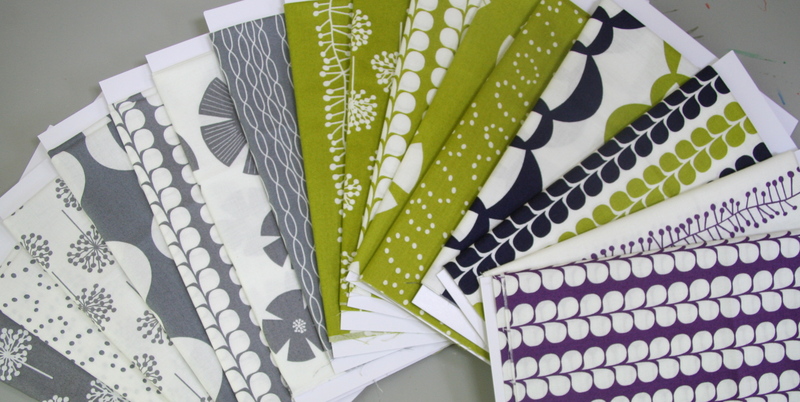 I purchased this bundle from Tactile Fabrics (one of the few Etsy stores that carried this line). Glimma by Lotta Jansdotter, who can not like this. I am super excited to do her surface printing workshop in June to celebrate my birthday….I cannot wait….6 weeks to go. I was not sure about the indigo prints but the more I look at it the more ideas pop into my head about what projects I can do with this fabric. I think though that the bundle will have to stay complete for a while longer. 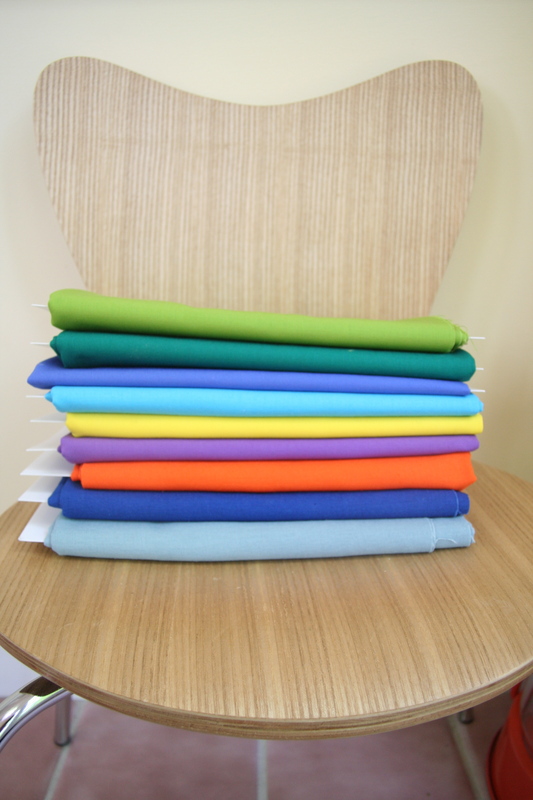 Of course this new bundle is available several places, I did however want a 1/2 yard bundle with the solids included. I found that Westwood acres had the 24 piece 1/2 hard bundle (I love this Esty store; next week I will show you the other bundles I purchased from here..there is a list ;-)). Fun Prints: Lastly, I have been buying prints for making kids pouches or pencil cases etc. I thought these prints are perfect for girly pouches or even chair bags. 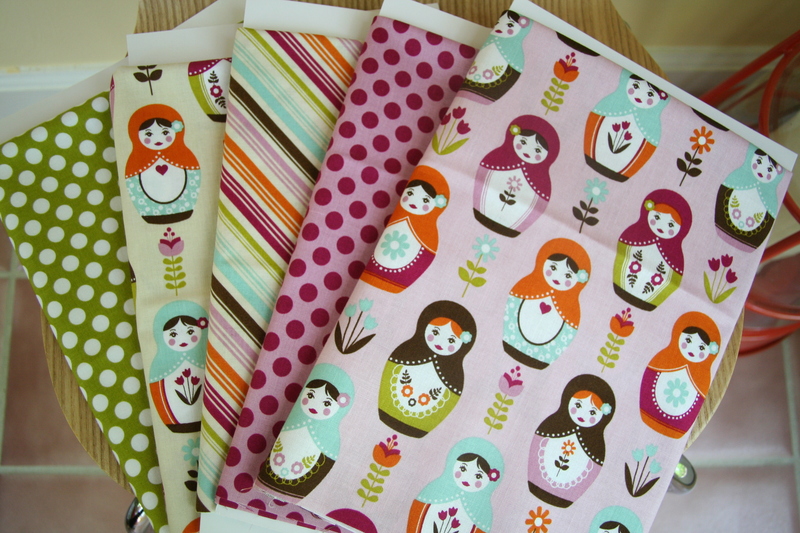 These are 5 prints are from the Little Matryoshka Collection by Lori Whitlock for Riley Blake Fabrics. I was not able to get them from one vendor. So from left to right; 1 yard of the Green polka dots and cream dolls were from The Sew Sweet Shoppe, 1/2 yard of Stripes from Bee Yourself Fabrics, and the last two were a 1/2 yard bundle, the pink polka dots and pink dolls, from Hoot Couture . My last admission, is I am almost finished the 5th 100 comic board inserts set that I use to store my fabrics nicely (as you see above). So, the proof will be in the pudding – I need to start using some of these and put items in my Etsy store, that will be my goal for May and June. Linking up with Plum and June “let’s get acquainted”. This entry was posted in Uncategorized and tagged bright solids, Chevrons, chicken wire, color perspective, Essex Linen, fabric, fabric stash, fat quarter, Glimma, Jen Ski, Kona cottons, Lori Whitlock, Lotta Jansdotter, Matryoshka collection, Moda, print colors, Pure, quilting, Riley Blake, Stof, yardage on April 21, 2013 by mlwilkie. Thanks…while I have you here 😉 The NZ patchwork tea-towel on spoonflower….is there any way to get the fabric without the calendar? Sure, no problem, if there is a specific colour and any other changes, just let me know, I am happy to design to your requirements and can send a jpeg of the pattern etc. I can buy one here in the US…I checked before I ordered :-)….that way you don’t have to work out how to send it. Thank you. :-)….I would love to be able to do something with yarn like crochet. My grandmother showed me when I was kid but I have forgotten. Probably lucky as I don’t have much room for anything else at the moment. Wow, nice new fabrics! I love the solids, I’ve been trying to get more colors lately. The Sew Mama Sew store is having a closing sale and I went a little crazy (for me, anyway! I didn’t buy half of what you’ve shown here ;-). So much pretty! Love how tidy it all looks on the comic board inserts! 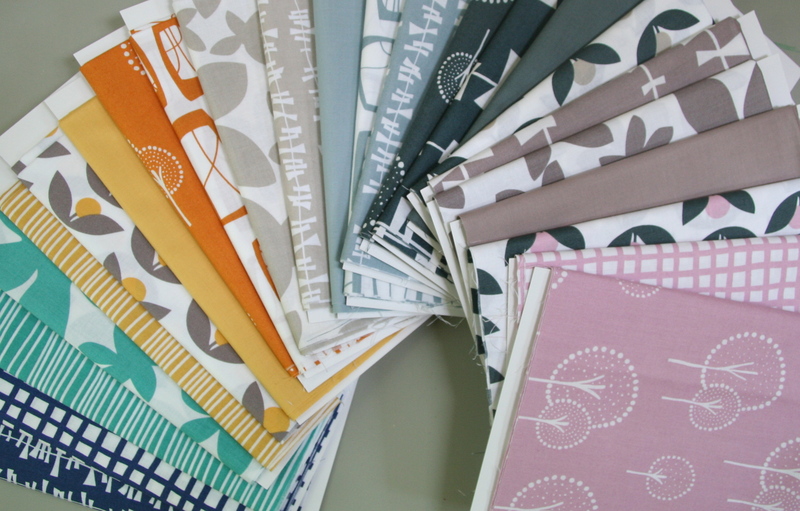 Absolutely beautiful fabrics…and I love the organization too!